This article originally ran in September 2014, but with the new school year, we know you're on the hunt for new lunches and after-school snacks. Today: Level up your PB&J. 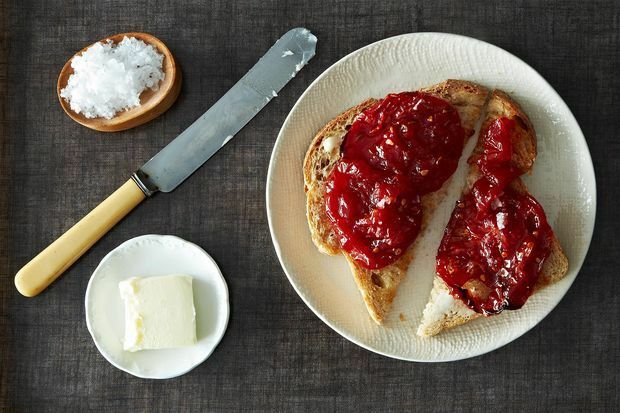 Pair almond butter with stronger berry jellies, like raspberry, or with pumpkin butter. Cashew butter is amazing with a few swipes of apple butter. Try cream cheese and jelly (yes, it's good). Tahini and tomato jam are a nice pair, too. More: Use a knife that's built for sandwiches. 2. Spice things up: Cinnamon is amazing on a PB&J. You know what else is surprisingly awesome? Peanut butter mixed with honey and red pepper flakes (some spicy honey also has the same effect). Or test out your own concoctions, like this spicy Thai version. 3. Add some crunch: Scatter some granola between your peanut butter and jelly for a crunchy sandwich. Or use dried fruit for another interesting texture. If you want a sweeter combo, use peanut butter with some chocolate chips thrown in for good measure. And if you walk on the wild side, put some potato chips in that PB&J. Or, you can ignore all of this advice and add some ice cream in between two slices of bread for an ice cream sandwich and call it lunch. Just kidding! Sort of. Tell us: What's your favorite PB&J-style combination? One question: fresh or powdered ginger? I use powdered when I make the mustard. Search whole grain mustard recipes - and substitute and add. Or I would expect you could just add some to some whole grain mustard, but once I found out how easy it was to make, just made it. Take a hot pancake, spread PB then maple syrup....absolutely wonderful! I like Peanut butter, sliced avocado and sriracha. I have been wondering about avocado and PB...crunchy no doubt? You also asked about a favorite brand of tahini. Almond butter, banana and dried California apricots on challah! Not much to this article; a bit disappointed. My now-87-year-old-father-in-laws standby favorite - peanut butter and dutch-loaf with hot pepper cheese. The man is healthier than I am!! no one could possibly love peanut butter as much as i do but here's a lunch fav (sometimes breakfast too) sans p.b. Take a really yummy jam of your choice and spread on toast than top with a high quality cheddar (i go for the cabot clothbound)....sweet salty DELICIOUSNESS! Yes! I love sharp cheddar with any jam, sweet or hot. Love the range of butters suggested. Love mine open-faced/knife & fork for a sit down lunch--with rhubarb sauce, fresh frozen raspberry sauce or a combo of plum and apple sauce--all from my own fruit trees. For an on-the-go meal--some of those raspberries made into jam--wicked good as we say in Maine. Start with one rhubarb plant and just keep dividing it. Mine's a variety named Macdonald--beautiful and productive with upright growth, red stalks, huge leaves and white flowers. Rhubarb's more than a spring happening. Harvest all summer long and compost what you don't use. I pop off new plants each spring to share or spread around my ornamental and veggie gardens. Chop rhubarb stalks into 1/2 inch pieces, add a little water and stew until soft. Cool sauce a little before adding sugar. Good on its own or with raisins, onion, spices, chopped apples and other fruit for chutney. Great over yogurt, cake, sweet breads, on biscuits and . . . with peanut butter! feijoa chutney + almond butter. Had this in New Zealand, both were home grown/homemade (even the almonds), couldn't get enough. Oh and our host baked a fresh loaf of bread each day. Heaven on Earth. I'm a huge fan of PB&J! When I hiked the AT I ate it almost everyday for lunch - mostly on flour tortillas, swapping honey for jelly most of the time. It's a great protein and good energy. This past month I had a fun experience picking grapes at the Biltmore Estates, we all brought our lunch and out of approximately 21 adults at least 3/4 of us had some version of PB&J for lunch so it's still very popular. I just discovered Sunflower Seed spread - it's delicious! 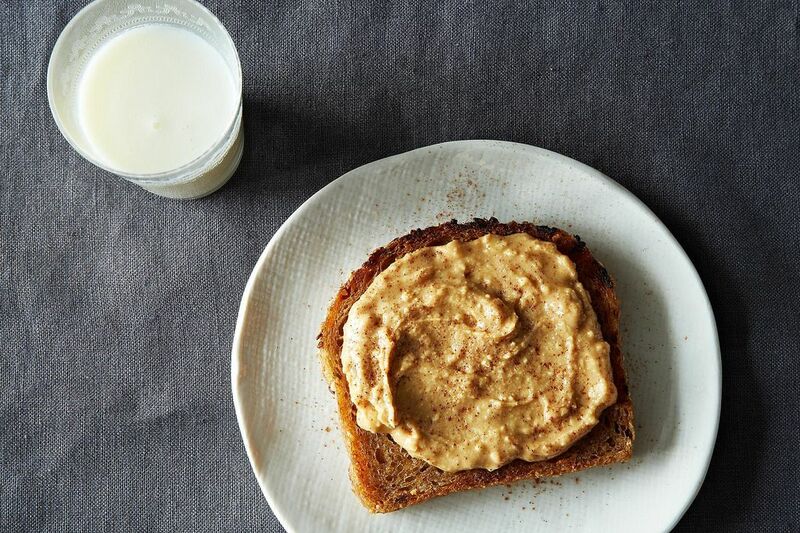 Tahini mixed with honey spread on crunchy hot toast is like eating halvah. Tahini added to hot cereal is also divine. anyone have a favorite brand of tahini? Peanut butter and fresh fruit (apples, blueberries, and/or strawberries are my favorites) on a nutty bread, drizzled with honey. Oh! And some cheerios or granola sprinkled in for crunch! Yums! I used to pack my dad's lunch for his work, and he too loved cherrios in the PB&Js I made for him! Sometimes I'd alternatively put in dried cranberries and he liked the change in texture too. This might be a bit radical, but peanut butter & ketchup and peanut butter & mustard work well. For the ketchup combo, you have the balance of fat, acidity, sweetness and saltiness whereas in the mustard combo, you have the same minus sweetness. Crunchy PB, thinly sliced apples, cranberries on toasted multigrain bread. Crunchy PB, raisins and sliced bananas grilled multigrain bread or in a low carb, high fiber, whole grain wrap. Salt and pepper crinkle kettle chips on the side. MEGA YUMMY! Another favorite in season is a slice of the "Genius" seed and nut loaf slathered with crunchy almond butter, topped with slices of strawberries - excellent for breakfast.